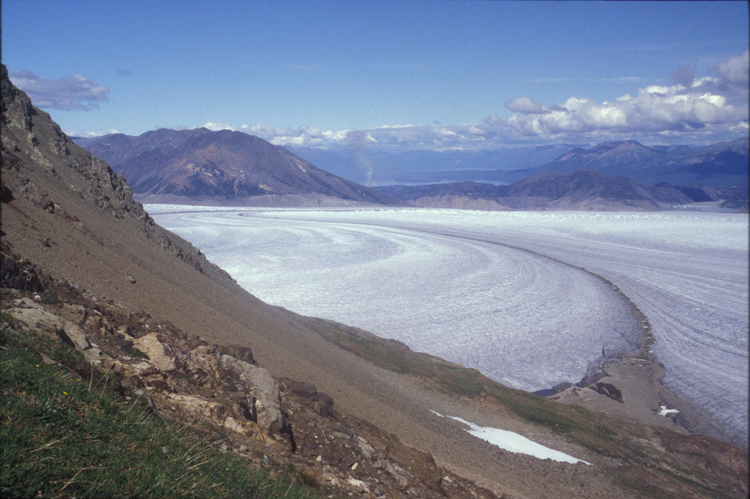 The lateral moraine from the previous pictures transitions into a medial moraine as it moves beyond the end of the C26 nunatak. It then winds its way down towards the terminus of the glacier. Atlin Lake is visible in the distance next to the plume of smoke from a forest fire. To get to Atlin Lake we walk down the glacier, staying close to the moraine for most of the way because there are fewer crevasses there, and then through the forest where the fire was. The fire was actually a little farther beyond where we went but it was a bit threatening. Ice flow folia are also visible roughly paralleling the medial moraine.